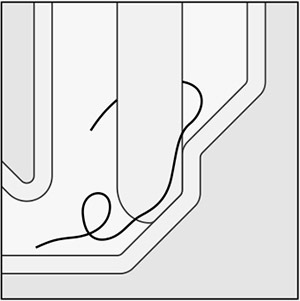 Freilauf is a patent drain, that doesn’t allow hair to get caught. The cover has a pole which contacts the drain at a single spot, down in the pipe and is stabilised by magnets. This is the only point where hair might collect. 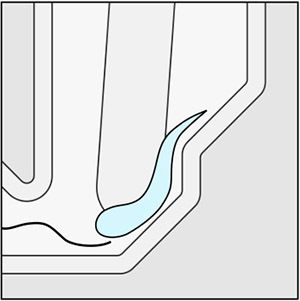 If you step on the lid, once in while during a shower, the pole slips out of its fixture and lifts a little bit of the ground, so the hair get flushed away. 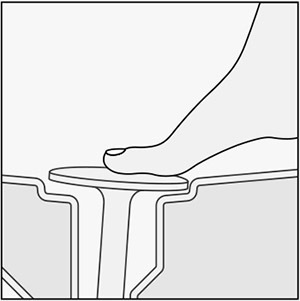 If you lift your foot, the lid snaps back in position by magnetic force. With time, in all drains an ugly film of soap and grease builds up and has to be cleaned. All other drains have edges, gaps and angles that are very hard to clean. The Freilauf is everywhere smooth and round and easy to wipe off. Because the drain is smooth and has no obstacles in the water flow, the flow speed is high and there is less build up. So, the cleaning is not just easier, but also has to be done less often. 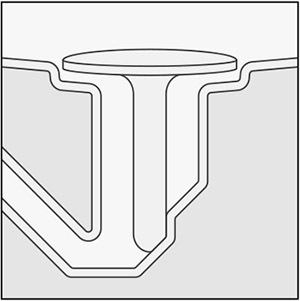 The Freilauf shower drain always consists of two components. The base body plus one out of four covers. 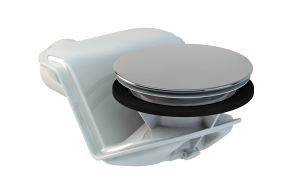 The covers are available with 90 mm or 52 mm fitting, the colours are chrome or white. Hair-free: No permanent obstacles in the water flow. Easy to clean: Everything smooth, no edges, gaps or angles. 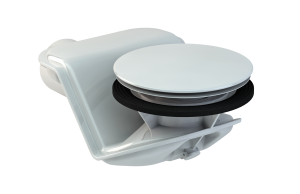 65mm installation height: Suitable for most flat, floor-level showers. 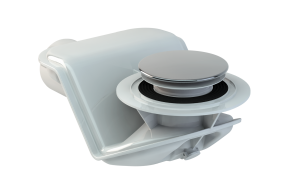 Just for shower trays out of enamelled steel: This is the first Freilauf product, Freilauf drains for other showers and the washbasin will follow. People that rent out apartments, frequently complain about high expenses in the plumbing sector. They name two problems: Some tenants don’t clean the drain at all, or just put chemicals on top. Once the drain is completely plugged, it’s the landlord’s duty to hire a plumber. Other tenants are a little over-motivated and unscrew the whole drain in their attempt to clean it. Putting the drain back together properly is difficult and not always possible. So, these attempts may cause leaking and expensive water damage. With Freilauf, plugging is no problem and the tenants can’t dissemble the drain. If the Freilauf saves just one minute time, cleaning the shower, every day in every room, it saves a lot of money. But for hotel owners another argument is much more important: Improved cleanliness. Today hotel ranking and customer review in the internet are very important for hotels. “Hair in the shower” and “water dosen’t drain” are some of the most common bad reviews. Freilauf reduces the probability of bad internet reviews.